Thunder center Steven Adams attempts a shot over Sacramento's Jason Thompson. Enes Kanter shoots over defender Carl Landry during Friday's game. Kanter scored 25 point and grabbed six rebounds. Kevin Durant scoots around the court before the start of the game. Durant will not return to basketball work for four to six months. Dion Waiters dribbles toward the basket during first half action. Waiters had 22 points, six rebounds and four assists. Russell Westbrook tries to block a shot from behind a Sacramento player. Westbrook flies down the lane for a slam dunk. Westbrook finished with 27 points, 10 assists and five rebounds. 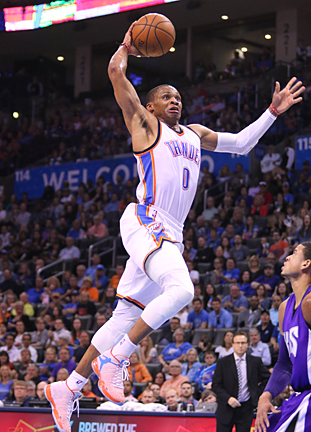 Oklahoma City had experienced nothing but losses during April until Friday night when the Thunder outlasted the Sacramento Kings, 116-103, with balanced scoring and a much improved defensive effort. The win allowed the Thunder (43-36) to keep pace with the New Orleans Pelicans for the eighth and final playoff spot in the Western Conference. The Pelicans swept past the Phoenix Suns, 90-75. However, New Orleans owns the tiebreaker after winning the season series with Oklahoma City. But for one night, the Thunder was able to enjoy some success thanks to a strong fourth quarter after losing four straight since April 1 with losses to playoff teams Dallas, Memphis, Houston and San Antonio. The Thunder finished with only six turnovers compared to 16 for the Kings. As usual, the Thunder was led by Russell Westbrook with 27 points, 10 assists and five rebounds. However, the Oklahoma City point guard wasn’t the only team member in double figures. Center Enes Kanter finished with 25 points, Dion Waiters had 22 and three-point specialist Anthony Morrow knocked down 19, including five of 10 shots from behind the arc. Always-reliable veteran Nick Collison returned to the lineup with a solid performance that included five points, seven rebounds and a rebound. Collison received a rousing ovation from the Thunder faithful when he entered the game at the 5:07 mark of the first quarter. Sacramento played without the services of the team’s leading scorer and rebounder DeMarcus Cousins who was out with a sore right foot, Darren Collison and Rudy Gay who was not in uniform due to a concussion. The injuries didn’t keep the Kings from keeping the game close until late in the fourth quarter as Westbrook hit two free throws, giving Oklahoma City a 108-97 lead. Prior to that, Sacramento had been within striking distance, but the Thunder offense was too explosive to contain for long. Each time the Kings made a run, Oklahoma City responded with a series of baskets or free throws to widen the gap. The first quarter was critical for the Thunder after being humiliated by the Spurs three days earlier, 113-88. During the quarter, Oklahoma City scored 34 points to lead by 10. The Kings won the next two quarters before the Thunder put together another 34-point performance in the fourth quarter. Although Oklahoma City dominated the game, Sacramento scored more points in the paint and tallied more second chance and fast break points than the Thunder. Oklahoma City plays Sunday at Indiana, which is fighting for an Eastern Conference playoff berth. The Thunder returns for its final home game Monday against Portland. Oklahoma City finishes the regular season at Minnesota on Wednesday. GAME NOTES: Both teams shot 45 percent from the field, but the Thunder took 16 extra shots…Sacramento grabbed more rebounds than Oklahoma City, 50-47.